Looking To Save On Central Heating? Have you recently purchased a home with old electric storage heating and would like to convert the heating system to gas central heating? Or maybe you are renovating your aged home and would like to replace the central heating system and install a brand new boiler, pipework, radiators and heating controls. This article will give you some budget prices for central heating installation including new boilers for different house sizes. Upgrading from electric storage heating to central heating can save hundreds of pounds in heating bills a year. Central heating installation is a relatively straightforward job for an expert installer. The only complication is found in accessibility for laying the copper pipework for the heating system. An empty house would make the installation easier and faster. For a two-storey four-bedroom house, it should take a team of two about 5 days to complete the installation. The cost of installing central heating in a home typically ranges from £2,250 for a two bedroom small bungalow up to around £4,500 for a 5 bedroom house. Prices in London and the South East of England will be a little higher. New condensing boiler including supply and labour – £1,250-1,850. Nine radiators including supply and labour – £1,100. Water tank supply and install – £200. Miscellaneous extras parts and labour – £265. Pipework supply and installation – £865. The total comes to around £4,000, and you will have a brand new heating system to bring joy and comfort to your home. The exact amount will depend on your location and the type of boiler you choose. To ensure your new central heating installation is as energy efficient as possible the hot water cylinder is insulated and fitted with a thermostat. The contractor will install all radiators with TRVs. Your choice of a boiler. The style and sizes of radiators you choose. Ease of installation, if your home is occupied it will take longer to move stuff around and install the pipework. Gas boiler supply and installation – £1,100-1,700. Radiators parts and labour – £830. Pipework supply and installation -£230. Extra parts and labour – £230. Central heating installation for bigger properties with more rooms and on three or more floors will cost considerably more. Zoning heating controls are essential for better energy efficiency. Zoning heating controls will separate the different parts of your home into different heating zones. For example, the system will treat each floor as a separate heating zone and will only supply heat to selected floors at certain times of the day. If you have children who are at university and only come home occasionally, the heating to their rooms or floor can be turned off when they are not at home. Get FREE Central Heating Quotes Today! Installing intelligent controls as part of your central heating is vital to getting the most out of your central heating system. Controls such as room thermostats, TRVs, and wireless sensors will significantly improve your system operation and efficiency. Installing room thermostats into each room is the best way to attain ideal temperatures for each space, without relying on a single thermostat. When used in conjunction with TRVs, room thermostats will save you money without sacrificing the comfort of your home. A heating engineer will supply and install new wireless room thermostats for between £125 and £190 per room. You may be able to negotiate a reduced labour charge if you are installing thermostats in some rooms. The work should take two hours per room and once complete you should experience noticeable differences including better environmental control. The simple and direct answer to this question is an emphatic no! Electricity costs three to four times more per unit than gas. Unlike gas, nearly all homes in the UK have an electricity supply, which would make electric storage heating seem like an option for some homeowners. However, the costs of running an electric heating system come to around £2,000 per year for a system consuming 13,500kWh per year. Compare this to around £500 in gas bills for heating and cooking for the average home and you will quickly see how cost effective a gas central heating system is. The few benefits of an electric heating system include no annual maintenance as the storage heaters are virtually maintenance-free. Also, installation costs are lower as no pipework is required. However, that is where the benefits end. If you do not have mains gas supply then portable gas or oil is a better option. Moving from electrical storage heating or oil fired heating to gas central heating is a significant investment and well worth it. The price of gas continues to be lower than both oil and electricity, so you will begin to see the savings in the first year. Couple a gas central heating system with a well-insulated house and up to date heating controls then you will get to enjoy a warm and cosy home for less cost than before. 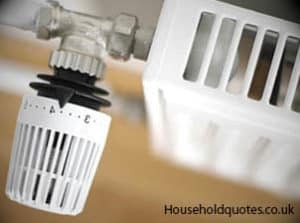 Getting quotes from contractors with a checkable work history is ideal for finding the perfect tradesman to install your central heating system. Get started with your new central heating installation project by our free quotation service today. Get Your FREE Central Heating Quotes NOW!